Guys, maybe to centralize all questions regarding the I2C OLED (Crius or others) we can post here. My OLED has the strange behaviour of only showing random pixels when connected during boot/power-on. It does show the 'heartbeat'/pulse when the logo should be showing, but it doesn't show the logo. When I connect the OLED on I2C after MWC has fully started, it shows logo nicely, but still no telemetry. 1. does it throw i2c errors with/without the oled attached upon startup? 2. with lcd.telemetry.auto you have to trigger the display once via the stick combo. it will display the initial 'multiwii version xyz' & coptertype for 2 seconds, then automatically switch to display page 1. Stepping to next page requires stick input. same here, i have no i2c errors with/without oled upon startup. connecting after boot of mwii and display works fine. Crius is also known to have firmware problems with their lcd. So maybe it is just that and you are out of luck. Can you try with the other i2c speed? You mean the speed/frequency at which sensors are polled? Kept it standard for now, will try tomorrow and report back. I have two crius oled (co-16) and have the same problem with both. Random dots at startup unless it is connecetd after full initialisation of the oled. Could it be a problem with the init sequence? I have two oleds from wide.hk both connected to simple crius boards on helis and both work ok.
crius has a reputation for wrecking firmwares of displays. They did it with serial LCD some time ago - thread here in forum somewhere. Maybe they did it again with oled. I have no proof this is the case and/or how to repair/flash a working firmware. But it seems a good guess as to what the reason for failure is. So in future maybe best stay away from crius displays. Strange thing is (strange pixelation also happens with different I2C speed BTW!) that it does work fine when OLED is connected after FC has fully booted. Also tried this on my Flyduino MEGA and sure enough, same shizzle, different board So that leads me to suspect some kind of I2C initialization error. Have just received obe of these displays and wanted to check it out using a bare Arduino ( Considering the display for a non 'copter idea) with the supplied ( China dealer) Arduino sketch I get precisely nothing on the display , no sign of any life !! , Have any members managed to get a display using a bare Arduino Mega or Duemilanove ? Bergerac56 wrote: I have two crius oled (co-16) and have the same problem with both. Random dots at startup unless it is connecetd after full initialisation of the oled. Could it be a problem with the init sequence? Hi, I have 2 of these screens and both give me the dots randomly on FC Boot. Tried connecting after and so far it works, first time into lcd config I get blank screen, come out I get the aborting exit, go in again I get all the config info but upside down??? reboot the FC and if the screen does not crash I get logo the right way up! After a lot of investigations it seemed that the reset/initialisation of the crius OLED co-16 v1.0 was the problem. I tried to solve this by modifying the software without result. As I did not find the "reset" pin to modify the way the oled was initializing, I used another way to stabilize the initialization process. I just inserted a 100 ohm resistor in the positive line of the oled. This lowers very slightly the positive voltage and, combined with the capacitance on the PCboard, adds some filtering of the 5v. This permits a correct reset of the oled driver chip. The easiest way is to insert the resistor in the positive (red) wire but it is also possible to insert it on the pcb itself (needs very good eyes ). Last edited by Bergerac56 on Thu Nov 29, 2012 6:55 pm, edited 1 time in total. thumbs up - good catch! Reset pin should be pin 14 of the 30 pin flat cable. seems to be connected to supply 3.3V. Using the Crius OLED: The board does not seem to have SDAin and SDAout connected to each other so you will not receive ACK from it. For those fiddeling with your own code for bare Arduino you will have to make your code not care about ACK. The 100 ohm resistor trick didn't work for me. I also tried 470 ohms which made and it worse and 47 ohms. I attached a scope to the 5V supply and it rings, perhaps due to the inductor on the board, and when the display comes on the voltage dips and screws up the display again. Also in the data sheet above (second from last page) it gives the exact software configuration of the chip. I replicated this in the OLED init routine and followed it with a simple text message. Still didn't work consistently. I have wasted a day and I am still at a loss, it's not the reset pin I suspected it was but it does appear to be a function of the power supply. Before I pull all the components off the board and start again from scratch, based on the discussion above does anybody else have another suggestion or two ?? RESET pin should be pin 14 of the 30 pin flat cable. On the photo you can see that you have used the pin 13. Is it positive these problems are limited to crius oleds? I have 3 oleds from wide.hk direct or via ebay and never had any of the issues with powerup / init. Jantar wrote: RESET pin should be pin 14 of the 30 pin flat cable. D'Oh, did I really get the wrong pin?!! These things are too small even with a magnifying lamp. YAY, FIXED IT Simple schoolboy error before, using the right pin certainly helps! An RC network is all that is required. I have another board to double check and then I will post the best layout with photos later in the week (getting late here in UK). For those that can't wait ... you just need something like a 100K resistor connected between 5V on the 4 pin connector and pin 14 on the display ribbon (once you have cut either side of the pin and lifted it off the board with a small iron, as shown above, with some insulating tape). Then a small capacitor between 10nF to 100nF connected between pin 14 and GND on the 4 pin connector. Thank you Jantar for pointing out the obvious mistake. BTW I tested also with 2 Crius AIO V1.1 boards, with one HK SE V2 and one HK Lite V1 It worked with both "tricks"
1) Start by using a scalpel and iron to isolate pin 14 (not 13!) and place some tape to prevent shorting. 2) You must pickup VDD from pin 9 for the resistor, this is the 3.3V supply used by the "core logic operation" (you can probably use the 5V supply but you will be over-driving the input and relying on a "catch" diode on the chips input). Then soldered a 100K resistor between pin 9 and 14. 3) Solder a 10nF capacitor (or 100nF) to pin 14 on the other side. 4) Connect the other-side of the capacitor to VSS (GND), Pin 30/31 is a convenient location. Yes, it's tiny delicate work. If you are using wire ended components then I would probably just solder to the back of the 4 pin I2C connector and have a flying lead to pin 14. Hamburger wrote: Is it positive these problems are limited to crius oleds? Yes, I believe it is just the Crius version. I got mine from RCTimer. The HK one looks to have a different set of components with larger capacitors. The Paris version from MultiWiiCopter also seems to to work. I didn't do enough research before I got the Crius CO-16 v1.0, so when I enabled the defines below, as you might have guessed, NOTHING happened on that screen. No light, no dots, nothing. It's plugged into the usual Crius SE. Is this likely the 100ohm resistor + reset issue described above? That set of defines should be okay. My two Crius displays always showed something, the usual fault is a series of random dots on the screen that gets brighter than dimmer a couple of times but will not clear to give the correct display text. Best check your I2C connections again, especially SDA and SCL. thank you for clarifying. I will add a note to the wiki. Getting the oled crom another dealer sbould be the easiest route. Hi all, I have this electronics:. It seems to be like Crius SE, but not sure. 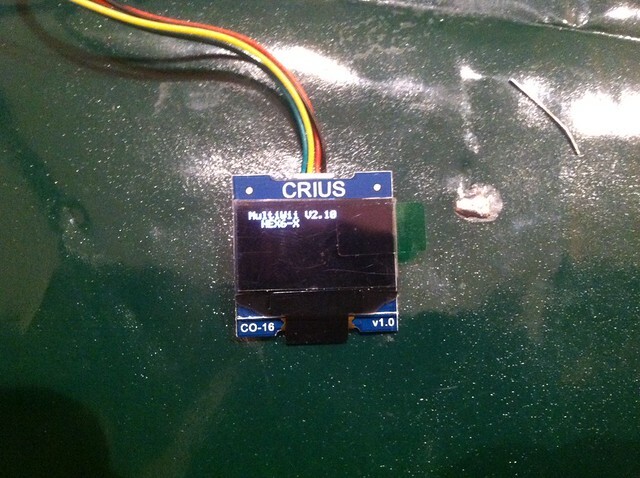 I have bought also a CRIUS CO-16 OLED 128x64 display, and I dont see anything when I connect to the board. May be the Multiwii 2.1 version inside doesnt have enable the corresponding "#defines". That is not a problem for now, as I can connect to my drone over bluetooth an android phone. Later I will try to extract the .hex file inside my board (for backup pourpouse) and flash a compiled one with the OLED #defines...but this is a project. For now, I dont have a logic analyzer to check more.. BUT, I dont seem to get the PID setting pages. And the battery voltage page is not reading properly (but I think I have to spend more time understanding the note on the config page about this) . I have, I think, 3 completely blank pages. I know one should be PID setting. Can someone tell me what setting I should have changed to be able to configure pids on the OLED? I can navigate through pages with full forward and full right roll stick input, but thats it. update: I notice that I get tons of I2c errors, and weird jumps in sensor values, if the OLED is left on some of the pages. ????? update 2: I turned off vbatt and buzzer and stopped getting I2c errors. Then I stopped having the gps work. Couldnt figure out what was going on. Messed around with gps and settings for a bunch and THEN I somehow ended up in the pid editing page on the OLED. Is it just a stick combo to get into that? And if so what is it? once I exited out of there, my GPS came back. I am confused about what just happened. Oh, that was helpful. Thanks! I have one of the Crius boards and I get the top two lines on the display. I can change the text so I know I am communicating. I can't get the board to show anything else. I have tried different combinations of settings in the telemetry section but nothing seems to make any difference. I just found the problem. I had to turn up the end points on my XMTR to get the board to recognize the commands. fantastic thread thanks to all contributors, got my crius AIO and crius oled display working in 20 minutes after having "random snow flake dots" issue by using 100 ohm resistor (guess i was lucky not to have to use the capacitor.) the link to hamburgers stick commands downloads was a bonus! Not with Wire.h, but i combined the MultiWii I2C code and the demo code and got it working just fine. I uploaded the resulting code to github, it works with Arduino IDE 1.0.3. I am curious as to why it doesn't work with the Wire library, if you figure it out please let me know. My oled works with your coding. Thank you. Greate job. The reason off the failure with the wire-library is the missing acknowledge from the oled. It never send an ack. I have checked it with a 2-ray oscilloscope. Hubbie0001 wrote: My oled works with your coding. Thank you. Greate job. The reason off the failure with the wire-library is the missing acknowledge from the oled. It never send an ack. I have checked it with a 2-ray oscilloscope. Checking deeply this in the datasheet, there are two wires coming from the sd1306 controller, but in this oled only the SDIN is connected. If you join SDOUT to SDIN it should send the ACK (not tested, dificult to solder...). jgarnham47 wrote: Yes, it's tiny delicate work. If you are using wire ended components then I would probably just solder to the back of the 4 pin I2C connector and have a flying lead to pin 14. Thanks for posting details of it, today I have fixed my OLED screen using wire ended components, and yes it really is a bit fiddly. Especially lifting pin 14 from the board. Still, it seems to work OK. I used some silicon sealant/adhesive to hold the components in place too. Glue gun would probably be OK for that too but i don't have mine out here right now. Here's a picture of my fix, not as clean as johns but it works just fine. Greetings! I just received two Crius CO-16 OLED displays from RCTimer and have experienced the random dot problem. 5 volt line I came up with a better and reliable solution. Apparently, applying 5 volts to the module and controller at the same time scrambles the display. I designed a circuit using a NE555 timer IC to create a turn on delay of the 5 volts applied to the CO-16. About a 1.5 second delay does the trick and works every time. I used pin 3 of the NE555 to power the display directly, as the 555 can source over 200 ma. Hope this info helps. ardufriki wrote: Checking deeply this in the datasheet, there are two wires coming from the sd1306 controller, but in this oled only the SDIN is connected. If you join SDOUT to SDIN it should send the ACK (not tested, dificult to solder...). Hi, I´ve got the ACK from the SSD1303 chip inside our OLED(seen in logic analyzer). Just joining pins 19 and 20 with a drop of soldering (no so hard to do). Now it works fine with Adafriut libraries and other Arduino skectches. that's great ardufriki. i'll try that on mine when i get a chance. dominicclifton wrote: Here's a picture of my fix, not as clean as johns but it works just fine. Hello, I'm new here, and I come because buy 2 modules co-16 on ebay. for use with Arduino, but I can not print to display some character. Not if they are damaged or my code is wrong. Hola , soy nuevo aqui, y vengo porque compre 2 modulos co-16 en ebay. para usarlos con Arduino, pero no logro que imprima en pantalla algun caracter. No se si estan dañados o mi codigo está mal. What ever- is there a way to start showing the telemetry pages WITHOUT any stick input? use lcd.telemetry.step and first page in that sequence gets loaded&updated automagically. I use dual rate switching on my tx in such cases to enter stick combo inputs - like for stepping through the telemetry sequence.